To maintain a lush and healthy lawn, it is important to make sure the grass is getting the proper nutrients. 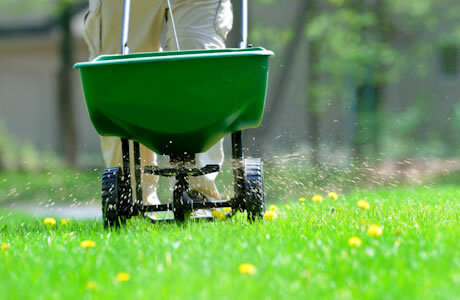 Our professional fertilization process can insure maximum results. We examine your property thoroughly in order to disperse the correct fertilizer for your type of grass, in the right amount , at intervals that will be most effective. During fertilization we can identify any problem weeds, and take corrective measures to prevent damage and spreading. Please call us today to speak to one of our experts for an estimate or to answer any questions you may have about Fertilization and Weed Control. Our licensed technicians will ensure the proper nutrients will be added to your lawn at the proper time of the year. This 7 application package includes pre-emergence weed control 3 times per year to help reduce weeds and 4 fertilization and post emergence applications during the summer months. Some weeds like dandelions do not have a pre emergence control. These weeds have to be treated after emergence. During every visit we include post emergence weed treatments to kill these hard to control weeds. If you need an additional visit in between services, we can schedule at no additional charge to you. Our treatments are scheduled 1-2 months apart depending on the time of year. This 10 application package contains the same applications as the 7 app package plus fire ant control, grub control and aeration. With this package you will receive a 20% discount on the fire ant control, grub control and aeration treatments. This 4 application package includes pre-emergence weed control 3 times per year to help reduce weeds and 1 fertilization and post emergence application. There are NO additional or free return visits in between services.